2017 is quickly winding down and it’s time to formalize my 2018 goals. Since I started this blog after the new year, I never officially made 2017 goals. But the goal that I worked toward all year was to finish 12 tops and 12 quilts, understanding that 1 quilt may be on both lists. Finish 12 tops and 12 quilts. This is general enough that all the goals that follow will count toward this one. Starting at least 2 new quilts just because. Not to meet a challenge or as a gift, bu just because I want to. I have some ideas, some bucket list quilts, but I want this to be open-ended. To have the freedom to go where my quilting journey takes me. Allterie will end up with at least 3 tops, maybe 4. 1 is done. 2 is to the border stage, but it will be a pieced border. 3 & 4 aren’t designed yet. Easy Street is part of the bins mentioned above. Finish my 2017 Rainbow Scrap Challenge quilt and stay on top of 2018’s RSC quilt. Make at least 2 tops from my scrap drawers. Some of them are overflowing, and I’d like to either use these scraps or move them out. Use my “collections”. I am actively purchasing Sweetwater fabrics and Disney movie fabrics. I also have stacks of Dr. Seuss fabric and Snoopy/Peanuts fabric. I’d like to start using this fabric in quilts or other projects. 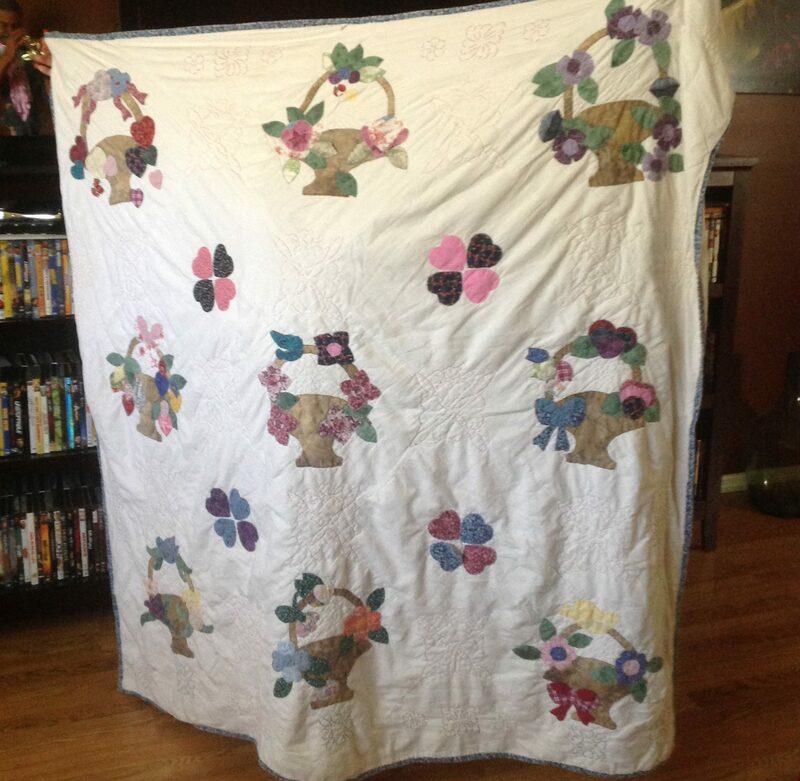 Make quilts for the important people in my life, namely my father. He is my quilt holder for pictures and general supporter of my quilt making. He also picks up the slack for me when I’m busy quilting. He’s mentioned a few times that he doesn’t have a quilt of his own. I’d love to have his finished by the end of the first quarter. I also have a great-aunt that’s 80+. Over the years I’ve started quilts for important people in my life, only to be distracted by other projects, and those important people have passed away suddenly. While I’m not expecting this to happen, I don’t want to regret not making them quilts. That’s all for my quilty goals for 2018. Looking forward to a fabric filled year! I like your 12 tops and 12 finished quilts goal, and congratulations for meeting that goal in 2017! I hope that by having a bit of planning here it will help you know what you want to say “yes” to. Thank you so much for linking up and may you have a peaceful 2018 full of quilting joy!